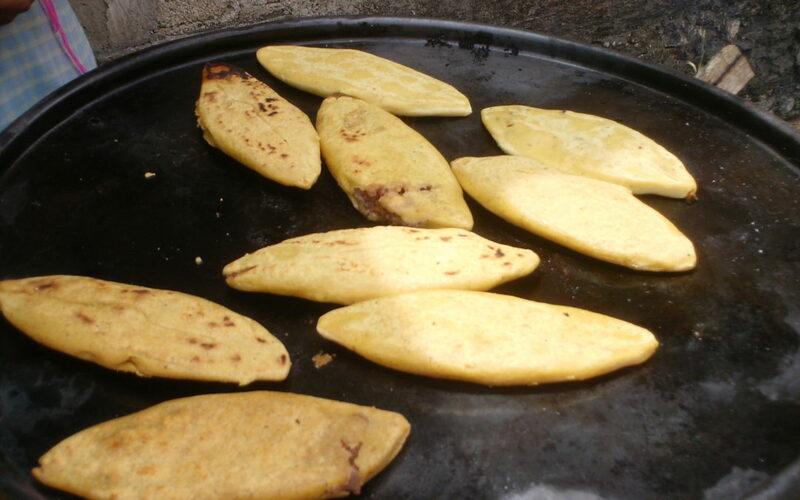 A comal is a plan of sorts that is used for cooking a variety of items. It is made of cast iron and is very heavy. When you cook with it, you don’t move it at all, like you might with a wok or a regular light-weight pan. It can come in round shapes or in longer, oblong shapes. You can even find large, rectangular varieties that will fit over two burners on a standard stovetop. The comal has a slightly rough surface unlike a non-stick or stainless steel pan. A comal is perfect for grilling carne asada (red meats) and vegetables(similar to how they serve fajitas in mexican restaurants like La Palapa ) The coal adds flavor to whatever you’re cooking, whereas it’s non-stick counterparts offer no additional flavors. It is also the utensil of choice for cooking tortillas on. You can also use one to quickly reheat tortillas as well. A comal is versatile because you can use it on the stove, in the oven or even on a grill. Just be careful because they get very hot and you will need to use a kitchen rag or potholders if you need to move it during the cooking process. When you get a new coal, you don’t want to use it without “seasoning” it first. “Seasoning” is very simple, first you want to wash the pan with warm soapy water and dry it thoroughly. Then lightly coat the pan with vegetable oil or shortening, it will prevent the coal from developing rust spots if it comes in contact with water. Place the coal in a hot oven, at least 350 degrees and bake it for one hour. Remove it, let it cool then wipe off excess residue. Re-apply the oil and then heat it for an additional hour, turn the oven off and then let it cool in the oven overnight. Wipe off any residues and your comal is now ready for use. Never put a coal in the dishwasher! After cooking with it, simply wipe down the surface with a rag or a sponge. Use a spatula to scrape off any excess food. If necessary, wash the coal in warm soapy water, but make sure to thoroughly dry it immediately to prevent rust. Every once in a while, rub oil on the surface to keep it well seasoned. The more you use a comal, the more flavor it will impart to your food, so use it often. Let the comal change temperatures slowly, do not expose a hot comal to cold temperatures such as cold water, until it has cooled on its own. If it does develop a crack, it is best to discard it. If it gets rusty, scrub it with steel wool until the rust is removed, rinse thoroughly and repeat seasoning instructions above.